Oreck is very well known in the vacuum cleaner industry. They are widely used in both commercial and residential applications which is a statement to just how well made they are. The XL Classic is a very lightweight upright that is likely their most recognized model. It has undergone several key changes over the years but still maintains the qualities that made it one of their most popular uprights: lightweight design with continuous suction power. The XL is versatile enough to clean multiple types of flooring. It really shines on low pile carpets like berber and hard floors by turning off the spinning brush roll. This is an important feature as the high spinning of the brushes can scuff and damage delicate smooth flooring like hardwood, tile, and laminate. Plus the dirt will just blow around instead of being pulled up into the collection bag. Another really unique feature is it can fold to an almost fully flat profile. This low profile operation allows you to use it under beds and some furniture without the use of less effective hand tools. Hand tools work great on those ‘above the floor’ items like curtains, pet beds, and cushions but aren’t really built for pulling dirt and dust out of carpet fibers. If you use them under your bed you really don’t clean up as much as a full sized upright. The Oreck XL allows you to do this without having to re-arrange your bedroom. One thing to also remember is Oreck recommends only using their Certified filter bags that start with the letter “AK”. Not doing this can result in damage to the vacuum, so you will need to periodically purchase factory replacements (not knock-offs). Fortunately it is easy to find these both locally and on the internet. 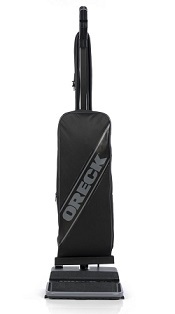 Oreck’s XL bagged upright lineup is built with a direct suction design. This means the interior path from the spinning brushes to the bag is virtually a straight shot, with no bends along the way. The engineers had a couple of things in mind when they came up with this too. First (and most obvious) is the efficiency of the motor and filtration. The XL has a smaller motor than comparable upright cleaners since less force is required. The motor first pulls the air through a small fan that breaks the dirt into tiny particles which then travel up into the cleaner. With no bends or other stops along the way, the suction stays constant with almost no chance of clogging. The second advantage to this design is the lighter weight. The motor is smaller and there are fewer components in the intake system. This provides a significant weight savings over other vacuums. And since it sits closer to the ground it really can spin the brush-roll fast, to ultimately increase the amount of dust that is pulled up. There are a couple of areas where the XL Classic struggles. It has a relatively narrow cleaning path of around 12 inches so it will take a few more passes than you might be used to if you have a large room. And the lightweight design of around 9 pounds works against it when vacuuming thicker or high pile carpets. It just doesn’t seem to get down into the deepest fibers of these thick carpets as heavier, larger models. Just something to consider should this describe your household. The Oreck XL Classic is a very lightweight upright vacuum cleaner with a no frills design. It is popular in commercial and residential applications, mainly due to its’ quality of construction and cleaning ability. Oreck is known for great filtration and building long-lasting vacuums. The XL lineup works well for the majority of households with a variety of floor types. However, like mentioned above, it will struggle to pull dust mites from deep down into thicker carpeting. It works just not as well as larger, heavier models that can really push the brushes down. This would be our only knock on it, but it is only a negative for homes with mostly high piled rugs. It’s a great choice for the majority of homes, especially those with multiple flights of stairs since it is so easy to carry. For more information including current pricing and consumer reviews, click here to visit our recommended supplier.